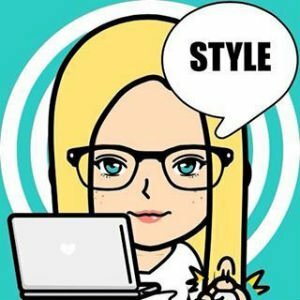 Each season Italian Kids Fashion House Monnalisa launches the newest collection with an impressive runway show at the historic Palazzo Corsini in Firenze. Located right on the banks of the Arno River, the late baroque style of the Palazzo Corsini was the perfect setting for launching the new Monnalisa Girls and Hitch-Hiker Boys SS17 Collections. 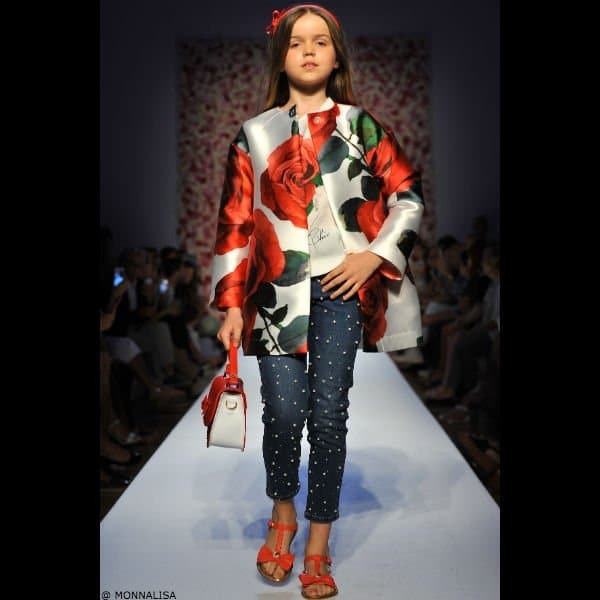 The Monnalisa fashion show is a highlight of the Pitti Bimbo Kids Fashion Week and Trade Show. Here are some of my favorite looks from the Monnalisa girls Spring Summer 2017 collection. This girl’s pale pink satin dress by Monnalisa Couture is the perfect special occasion look with a stunning, darker pink chiffon flower appliqué on one side, embellished with sparkling diamanté. Complete the look with a pair of girl’s light pink leather sandals by Monnalisa, with sparkling diamanté bows on the front. Looks perfect with a Monnalisa Chic Girls Pink Satin Flower Hairband and Girls stunning pink bag by Monnalisa Bimba made in soft pink and white leather, with pink glitter at the front. This gorgeous girl’s pale pink, silky dress by Monnalisa Couture features beautiful vertical bands of diamanté on the bodice. This perfect special occasion dress has an overlay of ivory tulle, is paneled through the waist for a shaped appearance, and has V-shaped panels around the skirt to give fullness. Looks great with a pretty girl’s pretty hairband by Monnalisa Chic decorated with pink, green and blue flowers. Don't forget a pair of girl’s light pink leather sandals by Monnalisa, with sparkling diamanté bows on the front. For a special occasion this Spring Summer, I love this stunning girl’s stunning embroidered tulle dress by Monnalisa Chic. This gorgeous dress has sparkling gold and white embroidered stars on a top layer of tulle, with plain tulle layers which form the petticoats of this smart dress. Complete the look with a pair of gold leather sandals, sparkling hairpiece and matching purse. Features on the runway at Pitti Bimbo Kids Fashion Week in Italy. Here’s quite the runway look for girls by Monnalisa featuring this sleeveless dress with dropped waist made in slightly textured cotton print of flowers and precious jewels. It has a polka dot patterned tulle at the neckline on the front and back and is adorned with a jewel-like necklace. Complete the look with MONNALISA CHIC Girls Ivory Leather Sandals, yellow leather purse, Oyster Pink Sunglasses and a sweet yellow bow headband. 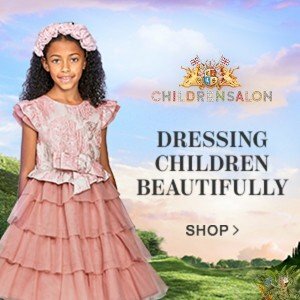 Gorgeous special occasion looks for girls by Monnalisa Chic featuring this pretty pink dress made of smooth, duchess satin with a detachable, grosgrain ribbon belt embellished with beautiful flower appliqués. In a truly royal style fit for your little princess, this sweet dress has a wide neck, capped sleeves and a dropped waist, with a full, gathered skirt. Looks great with a Monnalisa Girls light pink long-sleeved bolero with a sheer tulle overlay across the shoulders and back. Complete the look with a stylish pink hat, pair of glittered pink sandals and matching Girls Pink Leather & Glitter Bag. Love this elegant girls ivory coat by Monnalisa Chic made with a striking print of red roses and green leaves. Looks great with a pair of embellished girls stretch denim jeans by Monnalisa Bimba with pearls and sparkling pink rhinestones down the front of the legs, with a silver leather branded badge on the back waist. Complete the look with a Monnalisa Chic Girls Ivory Rose & Diamanté T-Shirt, Red Patent Leather Sandals, Girls Quilted Red Rose Bag and Red Ribbon Headband. 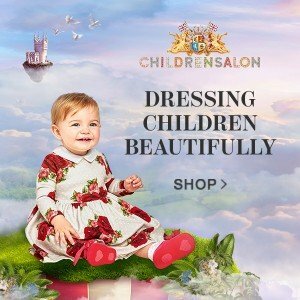 Gorgeous red rose special occasion look for girls featuring this beautiful sleeveless dress with a red rose print by Monnalisa Chic that flares out from the waist and comes with a removable, white synthetic leather belt. The dress is lined with cotton and tulle for extra fullness. Looks great with a Monnalisa Bimba Girls Red Bolero Cardigan and matching Monnalisa Chic Girls Quilted Red Rose Bag and Girls Floral Slip-On Shoes. Complete the look with this stunning red brim hat. Love this special occasion look for girls by Monnalisa featuring this beautiful girl’s red dress with a shiny, red, adjustable belt and bow. Designed in Italy this stunning dress is made of a woven polyester sateen with a lovely sheen, with a wide neck, pretty capped sleeves, and a fitted bodice. Featured on the runway at Pitti Bimbo Kids Fashion Week in Italy with a matching red brimmed hat, red leather bag, and white ballet flats. Minnie Mouse is back! Your little girl is going to love this pretty white dress with a fun Minnie Mouse print with flowers by Monnalisa Bimba. This adorable dress has tulle frills for extra volume, a wide, striped black, elasticated waistband, and a flared skirt. Complete the look with a MONNALISA CHIC Girls Ivory & Pink Flower Handbag, Pink Floral & Gold Leather Sandals and Festive Flower Hairpiece. The perfect look for her first tea party! Love girls ivory sleeveless dress by Monnalisa Chic made of textured, striped georgette, with a multicolor teacup print. This retro inspired dress has a box pleated skirt and comes with an adjustable, light green, synthetic leather belt. Complete the look with a MONNALISA CHIC Girls Pink Cotton & Tulle Bolero Cardigan, Girls Pink Leather Sandals, White Leather Purse with a Silk Flower, matching green ribbon headband and stylish Monnalisa girls sunglasses. 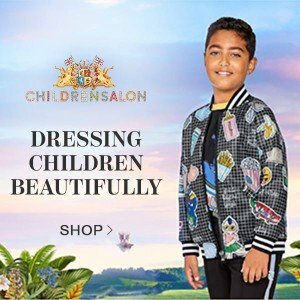 You can shop these gorgeous Monnalisa Spring Summer 2017 looks featured on the runway at Pitti Bimbo Kids Fashion Week online at Childrensalon, located in the UK and ships worldwide.